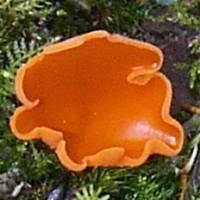 Aleuria aurantia, the Orange Peel Fungus, is initially cup shaped but develops into a contorted bowl, often splitting. It is most frequently found on disturbed soil beside woodland paths. 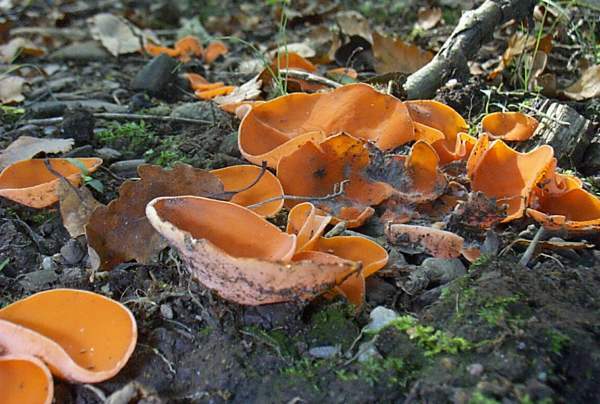 A fairly common find in Britain and Ireland, Orange Peel Fungus occurs also throughout mainland Europe, from Scandinavia right down to the southern shores of the Iberian Peninsula. This species is also found in North America. In 1799 when Christiaan Hendrik Persoon described this species he named it Peziza aurantia. 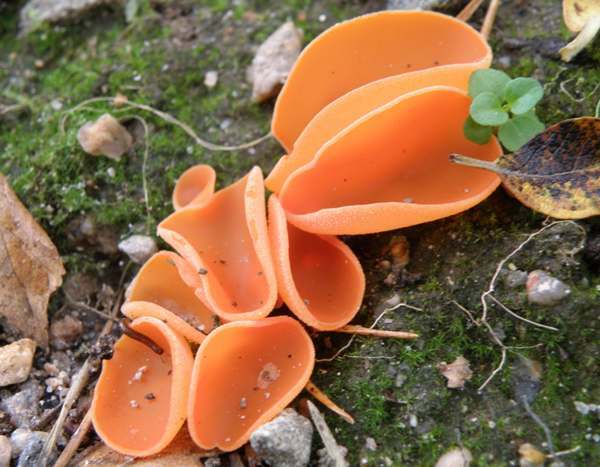 It was the German mycologist Karl Wilhelm Gottlieb Leopold Fuckel (1821 - 1876) who transferred Orange Peel Fungus to the genus Aleuria and gave it its present scentific name Aleuria aurantia in 1870. 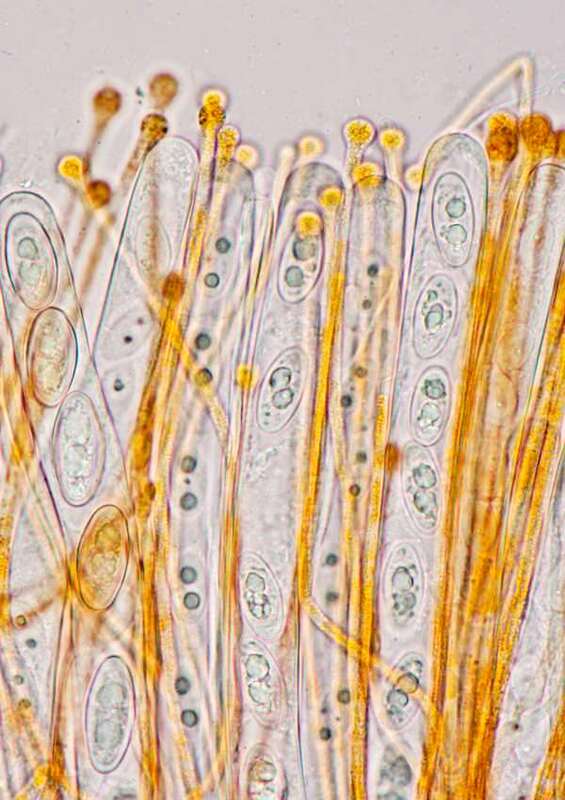 Synonyms of Aleuria aurantia include Peziza aurantia Fr., Scodellina aurantia (Pers.) Gray, Peziza coccinea Huds., Helvella coccinea Bolton, and Peziza aurantia Pers. 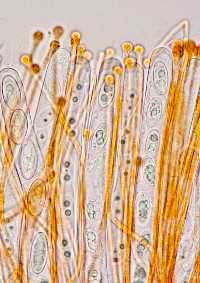 The specific epithet aurantia means 'golden' is a reference to the colour of the fertile surface of these cup fungi. 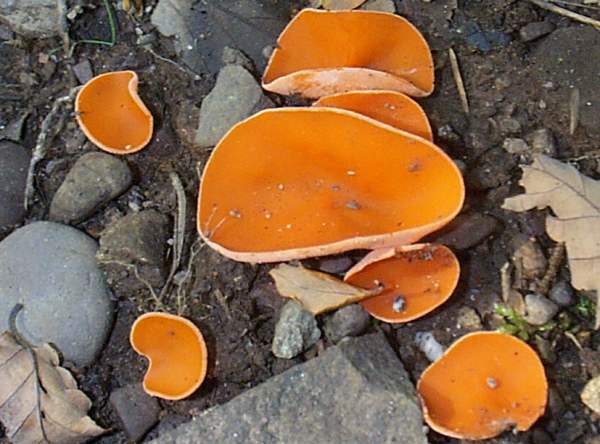 Although usually starting out as concave cup-like fruitbodies, sometimes the Orange Peel Fungus turns convex, as in the example above, and then it looks even more like orange peel. Recently cleared stony forestry tracks are particularly good places for pezizoid fungi, and Aleuria aurantia in particular seems to favour such exposed locations. 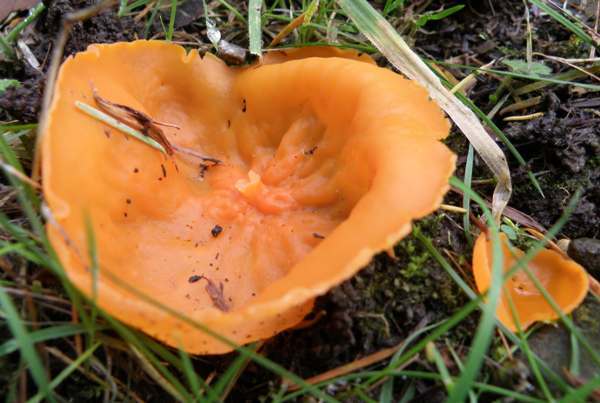 These striking fungi vary in colour from pale orange through to a very deep orange-red inside the cup, while the lower (outer, in cup-shaped fruitbodies) surface is paler and covered in a very fine whitish down. The cups are initially round but soon develop wavy margins and have a tendency to split. Up to 10cm across, but more commonly 3 to 6cm, they are shiny on the inside (hymenial or spore-bearing) surface and downy on the outside. The cup is typically 2 to 4cm tall and is attached to the soil by mycelial threads and without a visible stipe. 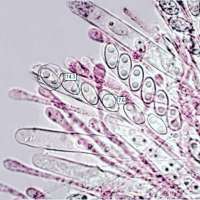 The pale outer surface of the cup is infertile; the spores are produced on the shiny inner surface of the cup. 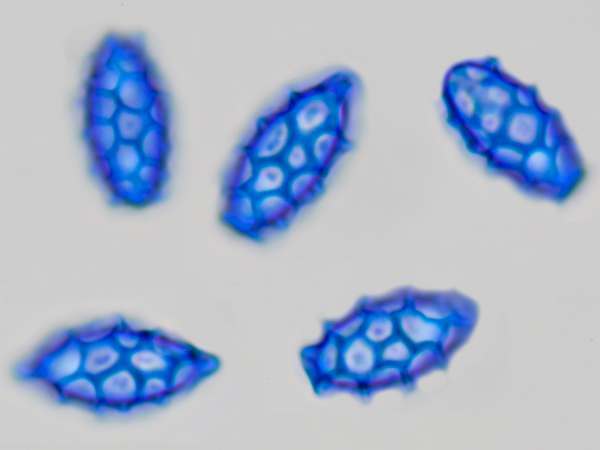 185-200 x 10-13µm, with eight spores per ascus. 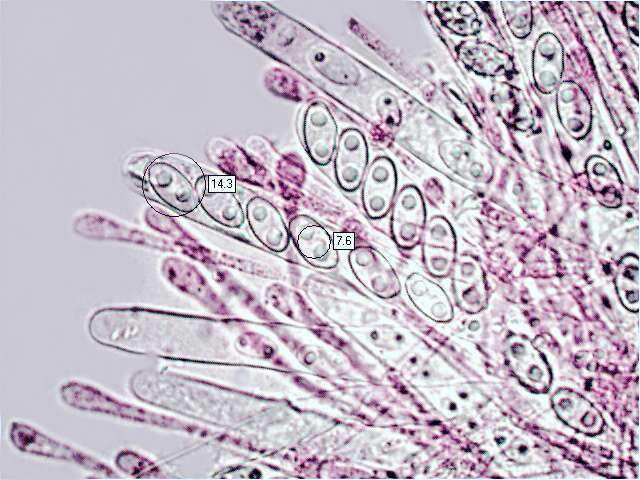 Paraphyses are structures of sterile tissue between the asci on the hymenial surface. 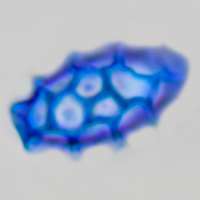 Ellipsoidal, with a coarsely reticulate surface, 17-24 x 9-11µm (including ornamentation); spores usually containing two small oil drops, sometimes with thorn-like projections at each end. Saprobic, on and beside disturbed paths, particularly on gravelly soil. August to early November in Britain and Ireland; later in southern parts of mainland Europe. Sarcoscypha austriaca, the Scarlet Elf Cup, is bright red and grows on dead twigs and branches, in mossy woods and sometimes under damp hedgerows. This is one of the very few common cup fungi that are edible; most of the others are in varying degrees poisonous, although some become edible if thoroughly cooked. 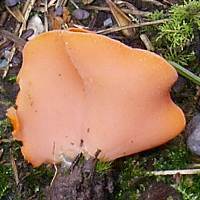 Unfortunately, despite its attractive appearance, the Orange Peel Fungus is not particularly tasty, and so it is rarely used in cooking except perhaps to add colour to salads.